Peel the potatoes, rinse them under cold water and thinly slice them. Cook the potatoes for 20 minutes in the 40 cl of crème, seasoned with the nutmeg, salt, pepper, garlic and couple of bay leaves. (you can replace half the amount of cream by the same amount ofmilk to make the dish lighter). Pre-heat the oven 210C. Scrub a dish with a pod of garlic, grease the dish with butter and pour the mix in. Coat the whole dish with grated cheese. Put in the oven for 20 minutes and serve hot. 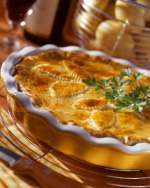 Tips: Use an unusual cheese to coat the “Gratin” such as a Munster and insert it between two layers of potatoes. Peel and rinse the potatoes. Skin and thinly score the onion. Chop the monkfish into even pieces. In a sautéed pan, fry the slices of chorizo in olive oil. When coloured, replace them by the onion and the pieces of monkfish. Glaze 3 min on each side. Deglaze with the white wine and complete with water in order to cover the mix completely. Season and add the potatoes and the chorizo. Cover and cook over gentle heat for 30 minutes. 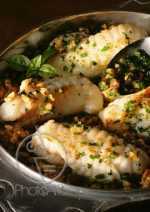 Set aside the potatoes and monkfish on a serving dish. Reduce the sauce over high heat and then pour it on the dish. Decorate with the chorizo and the snipped chives. Skin and chop the garlic. Rinse the salad, chop the onion, snip the herbs. In a salad bowl prepare the seasoning mixing the olive oil, vinegar, garlic. Add the minced onion, a tsp of cumin and a tsp of curry. Put the rest of curry and cumin in a plate and coat the sliced chicken breasts with the mix, then sear in olive oil. Add salt, pepper. Put the mixed salad, fresh herbs in the salad bowl with the vinaigrette previously prepared. Add the seared pieces of chicken. Cover the salad with the tomatoes cut in half. Peel the avocados and cut it in dice. Add salt & pepper. 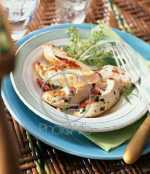 Tips: You can replace the chicken with 300g of red tuna and 300g of white tuna and add pine nuts. The salad can be accompanied with a fresh herb omelette. Peel the apples, split them in two and remove the hearts. Then cut them into thin slices and sprinkle with the lemon juice. Pre-heat the oven at 210C. Spread bits of butter on a tart tin and sprinkle caster sugar over it (and vanilla sugar to add more taste). Organise the appleson top and cover with the pastry. Prick the pastry to prevent it from raising. Make sure the pastry is tied in between the apples and the mould. Put in the oven for 30 minutes. Then leave it to cool down for 15 minutes before turning the apple tart over. Tips: to make a pastry, mix 150g flour, pinch of salt, 75g of butter and 3 tsp of water.